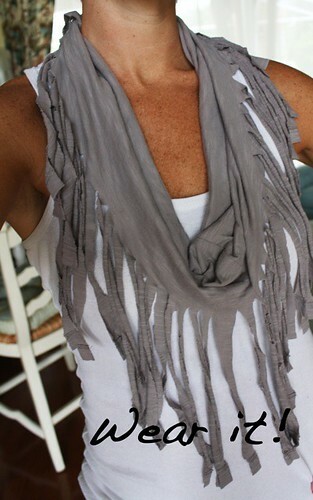 Make your own cute scarf---out of an OLD T-SHIRT! I made my own cute scarf…out of an old t-shirt! 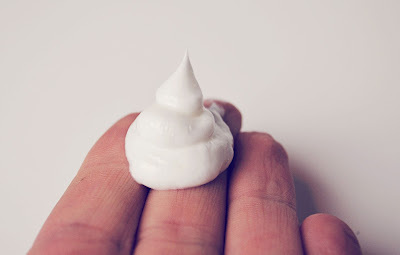 Seriously cute and frugal…and BIGTIME easy!! I was inspired by this outfit…..
Then I found this tutorial from Lake and Local on Pinterest…. Visit LAND AND LOCAL by clicking HERE to make your OWN!! It takes like 10 minutes TOPS!! Imagine all the CUTENESS POSSIBILITIES!! Hope you are having a MARVELOUS week so far!! One of the best things about where I live now…is that at any given moment…on any day…I can go hiking if my heart desires. This weekend my marvelous friends and I took full advantage of this. Hiking is good for the soul!! I am. I have been my entire life. My favorite paper for making lists = index cards. I find lists from my past and laugh. Oh how my lists have evolved. They used to be about Jaxon’s bottle schedule. Now days…they reflect graduate homework, business items and grocery lists. This week I couldn’t find my index cards but found some cute cards I bought awhile back from Hobby Lobby. I wanted cute notes…so I pulled out my stamps and ink. You can make your own using whatever paper and stamp supplies you have. You really don’t even need stamps, you could just use a pen or marker to decorate your own. Cute notes…are so much better than blah notes. The cards I used were meant to be used as folded cards….I just cut each in half to make two. I also made a few VENDOR cards to keep handy as well. I always find the cutest vendors for marketing and photography goodies…but I forget who they are. Now I have a cute note card to keep track of all the inspiration. It took maybe 10 minutes to craft the entire set. It is a simple way to make being organized…CAA-UTE! Hope you are inspired to make your own cute notes…and enjoy your cute organized fabulousity! Hi lovelies! 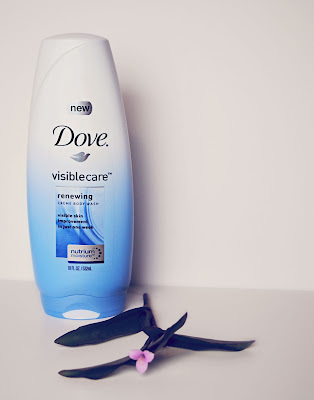 Today I wanted to share with you about my latest product review of Dove® VisibleCare™ Renewing Crème Body Wash. I love Dove® products so when I found out I would be reviewing one of their body wash products, I was ecstatic! With my move this summer, on top of Summer school, combined with being a single parent trying to get through grad school and run a business, I need anything that can help me feel rejuvenated, pretty and pampered. Dove® VisibleCare™ Renewing Crème Body Wash is a revolutionary line of premium body wash from Dove® that contains the highest concentration of NutriumMoisture technology across the Dove® portfolio. What I love is that I can have visibly more beautiful skin from a body wash. My shower suddenly turns into an at-home spa. Did I mention how luscious it smells? The Renewing Crème Body Wash has a fruity floral fragrance that includes a modern combination of pink mimosa and pomegranate. Dove® VisibleCare™ Renewing Crème Body Wash is a rich, pearlescent crème body wash with luxurious lather and clean rinse. The body wash gives you visibly more beautiful skin in just one week. I noticed tremendous improvement in the elasticity and moisture of my skin after using the body wash. In fact, I’m hooked on my Dove® VisibleCare™ Renewing Crème Body Wash. Now that I’m approaching my mid-thirties I want to take the best care of my skin possible, this makes my skin smooth, healthy and youthful. The Renewing Crème Body Wash nourishes and replenishes skin and it feels like a spa treatment right in my shower. 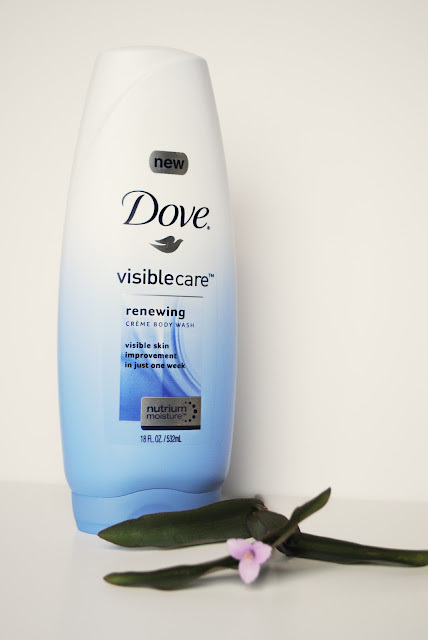 Dove® has three variants of VisibleCare™ body wash line. The new Dove® VisibleCare Toning Crème Body Wash helps to promote skin’s elasticity and strength. The Renewing Body Wash nourishes and replenishes skin. The Softening Body Wash softens skin and dry spots. Depending on your skin needs, I guarantee you there is a Dove® body wash suited to your skin. Summer is in full swing, and we have all shed our winter layers. Now is the time to make sure your skin looks it’s best! Grab a new Dove® VisibleCare™ body wash and feel your best! Visit the Dove® website to learn more about these amazing products. So tell me....how do you pamper yourself at home? Well I didn’t score anything marvelous this morning at garage sales…but I did get a few goodies at the Farmer’s Market. I loooove my flowers! They are $1.00 and they last all week!! They had fresh pie too…it was a hard decision. LOL! Today I wanted to share a little organizing fun with you. With my move + new house….I have new organizing challenges. I have a REALLY BIG bathroom…with no storage options. So I created my own. I made chicken-wire frames awhile back as memo boards. I used a big one to store my earrings…. I have yet to unpack/find the rest of my earrings…but I really like that they are in full view…ready to pick and wear at any given moment. It’s really simple…just hang each pair in a section of the wire. For my necklaces, belts and headbands….I used an old rake head I bought at a craft fair. It keeps my necklaces from being tangled…and in correct shape. Super easy…super cute…and super organized!! Do you have any organizing secrets for jewelry and goodies?? Lately I have received a bunch of emails requesting a tutorial on how I make my burlap flowers! I have heard your requests…and it has taken me a little while to have the time to make one…but I’m working on it this week! I can’t decide if I should do a regular photo tutorial or a Vlog for it. Hmmm….decisions…decisions. I really can’t wait to get this ready for you guys….and I can’t wait to see what awesome PRETTIES you create!! Hope you are having a SUPER BLESSED week so far! Do you go to your local farmer’s market? If not, you really should. It is a marvelous way to get fresh fruit, veggies and all kinds of homemade and home grown goodness. After we garage sale on Saturdays, we always stop by the Farmer’s Market. My goodies from this week were…. Don’t they just look marvelous! They make my heart happy! Hope your week is full of LOVE and BLESSINGS! Hope you all have a MARVELOUS 4th of July!! !